You know garden mulch offers a myriad of benefits for your plants, but did you know this magic mixture can turn you into a green thumb superstar? It’s springtime here in Northern Utah, and it’s time to plant those beautiful vegetable gardens in preparation for a bountiful summertime harvest. Your kitchen and grill will be overflowing with gorgeous veggies. Gardens love mulch, especially in the dry desert heat, and it’s one of the best things you can do to protect your garden and help it thrive all summer long. Weeds are the enemy of the gardener and you certainly don’t want those little moochers stealing all the moisture from your plants. Using mulch limits the amount of sunlight that feeds the weeds and acts as a barrier to keep them from gaining a foothold. Organic mulch absorbs water, which helps keep the soil cool – especially for those vegetables that need lower soil temperatures. 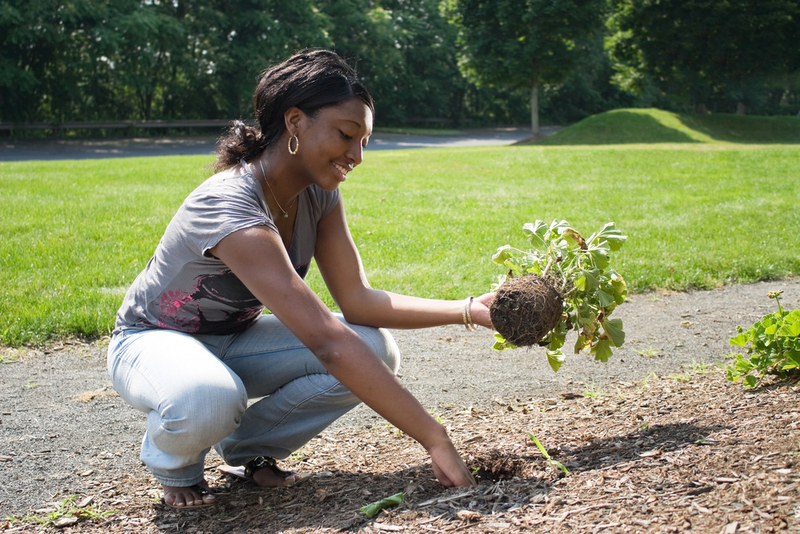 Mulch covers the soil and helps your garden retain precious moisture by preventing evaporation during the hot season. Not only does mulch keep water from evaporating out of the ground, but it also absorbs the impact from rain and other water sources. This prevents the soil from eroding and washing away, which robs your garden of valuable minerals. Not only does organic mulch keep soil nutrients from being washed away by the rain, but it also introduces new nutrients into the soil. As the organic components in the mix slowly decompose, they infuse downward, continuously enriching the native dirt and providing plants with the nutrients they need to thrive. Certain types of mulch (such as cedar bark) have natural oils that make for effective insect repellants. Avoid piling up the mulch against tree trunks or plant stems, however, as excess moisture in these locations can actually lead to increased pest and disease problems. All good gardeners know how valuable earthworms are for improving nutrient cycling and soil structure. Using an organic mulch encourages earthworms to move into your garden soil, which loosens and aerates the ground. Improved soil drainage reduces the chance of root rot and the worm tunnels allow plant roots to penetrate deeper into the soil, where they can absorb more moisture and nutrients. As a general rule, never add more than two to four inches of mulch in your garden. Adding too much can prevent water from entering the soil and dry up all your lovely veggies. Finally, if you have drainage issues, use mulch more sparingly to avoid drowning plant roots. As you can see, the benefits of using mulch in your garden are many. Not only will your plants and vegetables be happy, but spreading this rich, dark mixture around polishes up the look of your garden, giving it that finished look that will make you the envy of the neighborhood. The Dirt Bag serves Salt Lake City and surrounding areas of Northern Utah. You can have compost, garden soil, landscape rock and much more delivered right to your door. Contact The Dirt Bag today to order your garden mulch for all your spring planting projects.